More stuff flying out of the archives and into the Etsy store this weekend. In particular, I realised I had doubles of one of my childhood favorites. 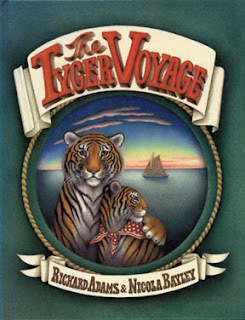 Up for grabs this week in the Great Monday Give is a nice, exlibrary copy of The Tyger Voyage. To be entered to win this unforgettable 70s fave, all you have to do is comment on this post before Sunday, March 14 at 11:59 PM. A winner will be selected at random and announced the following morning. The winner of last week's give, The Rooster Crows, aptly is Thy Hand Hath Provided (who just happens to keep an utterly fascinating blog about being a Mennonite homeschooling/ gardening/ chicken raising mom...) Congrats! Please send me your mailing info to webe(at)soon(dot)com ASAP and I might even get it out this afternoon! My obsession with Nicola Bayley began when I got The Mouldy as a child...I would love this. Please enter me for this one, I love the cover and the picture from it you posted a couple years back. Oh, wonderful! We would enjoy reading it. Thank you! Oh! I have been looking for this book! Would love it! We would also love this. We love Nicola Bayley's cats! my parents brought me home this book from London when I was young. I would pore over the illustrations! Now I'm an illustrator... what a magical book. I've had this on my wish list forever! I think Z would love it! I had this book when I was little and totally forgot about it until seeing it posted here! Wow. Enter me for this one. would love a copy, fingers crossed. Sounds like one my kids would love. Please enter me. Thank you. This book looks great. I am sure my son would love it. Nicola Bayley is one of my all time favorite illustrators. I would LOVE to win this one! I've never heard of this author or book, but it looks really cool! I ADORE anything that Nicola Bayley does! I can't believe I don't have this book, since I have most of her publications. Please enter me in your drawing - I promise to give your book a good home - right alongside the rest of my vintage children's literature collection. I'd like to think that my son has "great adventure in his heart" so this book must be for him. Please enter me. My sons would enjoy this. very cool book! would love to win! Love the cover and the book sounds so very good - thanks for the chance to win. This would be fun to share with my daughter! I don't know this book but I love the cover. I would love to share this book with my grandson who loves his stuffed tiger. I've never seen a fiction book solely about tigers before. Cool.